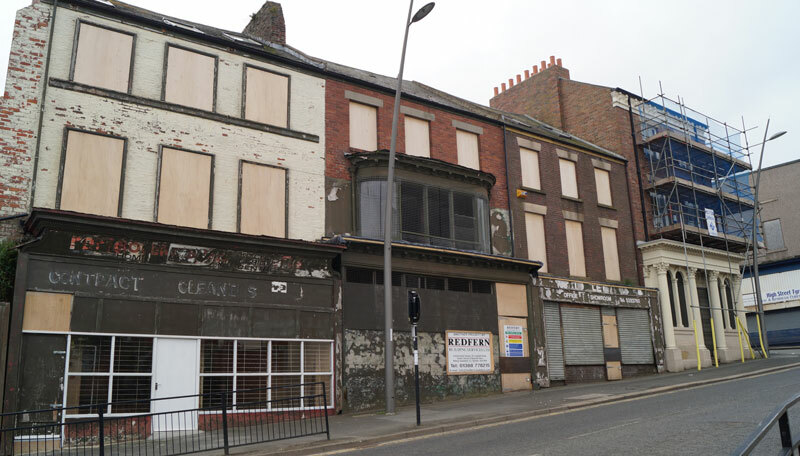 The CHL is focusing on three buildings on the edge of Sunderland city centre in High Street West, two of which are listed monuments, and one is not. This ‘Sunderland Historic High Streets’ area is now the focus of a new initiative from Historic England. It is one of the ten areas in the country that have been given ‘Heritage Action Zone’ (HAZ) status. The principle of HAZs is to use heritage as a key to unlocking problems of deprivation and dilapidation. CHL activities are carried out by the Tyne & Wear Building Preservation Trust (TWBPT), established to preserve the architectural heritage of Tyne and Wear through the repair, conservation and regeneration of historic buildings. The Trust is funded from a number of sources which include: rent from Alderman Fenwick’s House and Buttress House; grants from English Heritage and the Heritage Lottery Fund, other funds from grant-making trusts, local authorities, companies and donations from the public. The funds are used to acquire buildings and restore them. The buildings are then leased or sold and any surplus funds ploughed back into the Trusts’ capital fund which is used to finance further projects. TWBPT are working with a music social enterprise (Pop Recs). The latter can use two of the buildings, while one is retained by TWBPT for rent (giving the Trust an income), with a timescale to be in-site of 2019, to be operating in 2021. To explore the appropriate mixes of innovative and traditional funding mechanisms, including a combination of community share issues, and community bonds and crowd-funding. Developing new engagement and promotional tools, and strategies for funding (and phasing) which allow for the inclusion of different sources to contribute to regeneration through conservation of this part of Sunderland, under the umbrella of the HAZ, and work closely with the inhabitants of this deprived area. To act as a demonstrator project for innovative financial models and organization that can be subsequently replicated elsewhere by TWPBT and other organizations. Capacity building among local stakeholders and to connect to the nine other HAZ zones in England. Economic and social problems: Sunderland has high unemployment rates, an ageing population, scores low on innovation indicators, and the local authority is under austerity pressures. State of the heritage assets: Despite its significant heritage assets, the marginal location on the edge of the of the centre has led to issue of vacancy and poor repair. Re-use: It is a challenge to find a form of adaptive re-use of the buildings that is financially and socially sustainable yet maintains the historic fabric, and contributes to the wider regeneration of this part of the city.